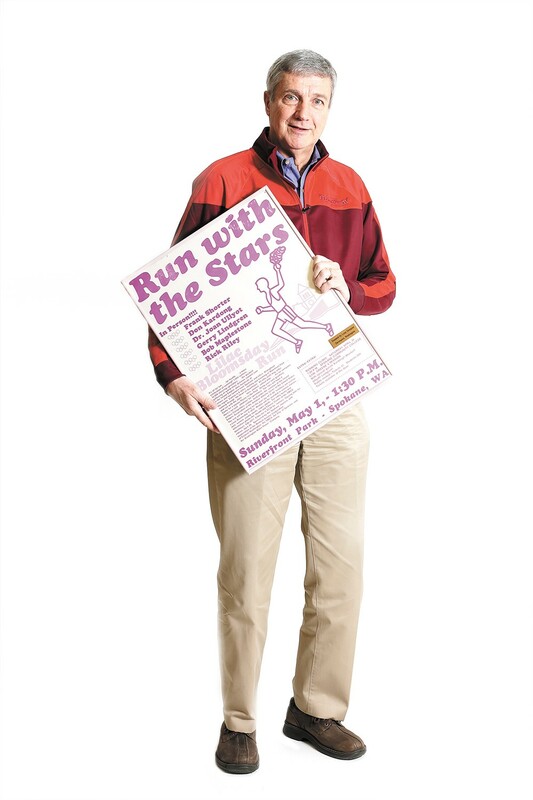 Don Kardong with the poster for the first Lilac Bloomsday Run in 1977. A counselor gig at Camp Reed with his Stanford track teammate Steve Jones introduced Don Kardong to Spokane, and he's never left. He was one of those lone joggers you'd see around town in the 1970s; what set him apart, however, was that he was actually training for the Olympic marathon after his teaching day ended at Loma Vista Elementary in North Spokane. (He finished fourth at Montreal in 1976.) After the Olympics, he had a chance meeting in an elevator at City Hall with Mayor David Rodgers. His idea for a race through downtown was born, and it hasn't stopped since that first starting gun in 1977. After a career teaching, writing, owning a running shop and as race director for Bloomsday, he's retiring at age 70 — just after this May's 43rd run. INLANDER: Running has gone from the lone runner — like Forrest Gump — to a very social sport. How'd that happen? KARDONG: Like in The Loneliness of the Long Distance Runner [a 1962 film based on the Alan Sillitoe short story], that was the ethic for a long time — a solitary pursuit. But in reality, it's always been both social and solitary. I still do most of my running alone, but when you get together with a team, it's special. Sophomore year in college, we were second in the nation. We just go together, 50 years later, and it was so great to hang around those guys again. What is it about Spokane and big events? In a bigger city, it can happen, but it just doesn't happen as often. In a smaller city, there aren't enough people. Spokane's size and being a little bit isolated has helped develop an ethic here about, "We're going to do great things for this city." We really rally around events. People know there are a lot of volunteers at Bloomsday, but when we tell them there are about 5,000, they're stunned. And our board of directors, they each take a huge chunk of the event. That's the only way we can do it. ...So what memories will you take with you? The first year was hard to beat. You have to understand, this was a brand new thing. Here we were running down Riverside, and I led all the way. To have this huge crowd come down really gave me a thrill. We crossed the Maple Street Bridge, through the old toll booths. The fact that it all came together is pretty memorable. Even now, that same collective adrenaline is fun to be part of. The evolution from that fateful elevator ride to tens of thousands crowding the streets every first Sunday in May has been immense. What's coming next for Bloomsday? We're looking at social media enhancements and other new technology to draw more people in. People say, "Hey, I'm not a runner." Well over half of Bloomsday entrants are walkers. The challenge right now is to try to get our numbers on an increase again. Bloomsday just announced that local attorney and Bloomsday board member Jon Neill will take over as race director after this May's race. [Neill moved up from Pullman to go to Gonzaga University; he became a Bloomsday intern in 1995 and has been involved with the organization ever since.] Sounds like you're leaving it in good hands. The original print version of this article was headlined "Q&A Don Kardong"